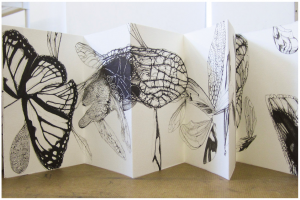 The NEXUS: Paper Lithography Installation is located on the first floor of Carlson Library. It will remain on display during Spring 2013 semester. This installation is a part of The NEXUS: Exploring the Link between Art and Science, a series of exhibits and lectures presented by the University of Toledo Department of Art and Department of Physics and Astronomy. The exhibits, based on scientific method, history, creative visualization and collaboration, will be displayed at various times during the Spring 2013 semester at the UT Center for the Visual Arts in the Main and Clement galleries, and on main campus in Carlson Library. 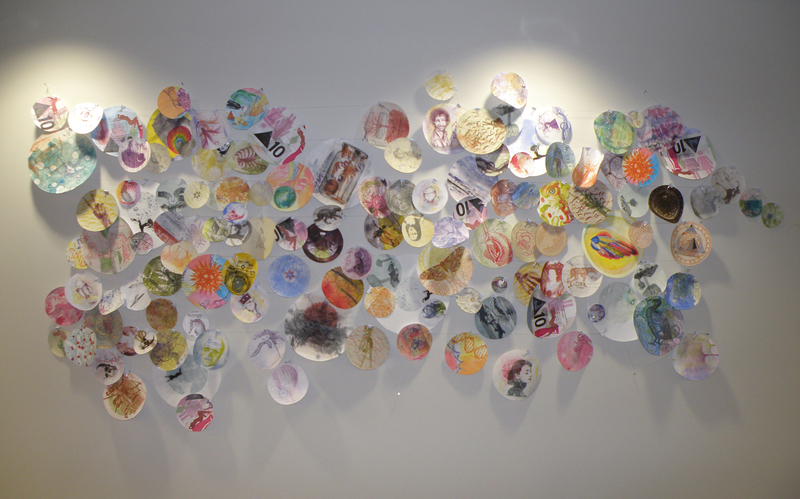 This project is the result of a collaboration of efforts of students enrolled in the ART 2110 – Printmaking course, taught by Associate Professor Arturo Rodriguez, and students enrolled in ART 3850 – Gallery Practices, a course taught by Lecturer & CVA Gallery Director Ben Pond. Reflecting upon and addressing relationships between visual art and science, the 22 printmaking students created images with a circular structure that used the medium of paper lithography. Students had several discussions regarding art and science, addressing junctures where the two disciplines have overlapping interests as well as where they deviate. Notable points of discussion included the Renaissance, a time when art and science seemed to be indistinguishable, as well as the commonality of artists and scientists sharing a critical eye and mind. Gallery Practices students developed the installation design of this project. 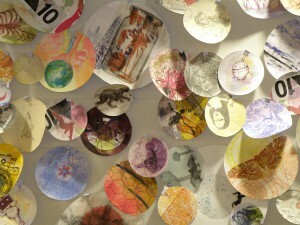 They considered the uniqueness of this art installation and determined that an effective and fitting display would utilize the circular paper lithography prints as cellular forms. Thus, the prints float, coalesce, remain movable, and mimic an organic arrangement of material. Student artists involved in this project are: Sasha Britton; Dee Brown; Angela DeAngelo; Weslie Detwiler; and Kayla Dopfer. Katie Heft; Jason Hinkle; Elizabeth Kiggins; Brittany Leslie; Valerie Meyer; and Michael Miller. Michael Nelso; Teresa Pacheco; Shannon Parcell; Taylor Pasquale; and Nathan Perez. Kellie Robinson; Kelsi Roth; Shermeen Sufi; Drew Tansel; Alexander Tsipis; and Anthony Wilcox. UT Department of Art student David Folck’s abstract has been selected from over 3,500 submissions to be presented at the 2013 National Conference for Undergraduate Research (NCUR). His summer research project, “Lang Leben die Insekten,” (Long Live the Insects!) will be presented when the conference is held at the University of Wisconsin-La Crosse April 11-13.